Chemistry Division is involved in research pertaining to soil-plant nutrients of tea besides extending analytical service to the industry. The research activities include investigations on physico-chemical properties of soil, soil-plant interactions, response of tea to major, secondary and micronutrients and their interactions. The research work related to increasing the efficiency of utilization of applied nutrients, response to foliar applied major and micro nutrients and interaction effects of nutrient levels, their ratios, the method and time of application with cultural operations such as pruning are the other areas of research. Soil fertility maps were prepared for certain estates in the Anamallais and the Nilgiris using GIS (Geographic Information System) technique. Digital map derived for fertility status of N, P, K and OM is of immense use to the planters to have site specific fertilizer management. Laboratory experiments were conducted to find out the impact of soil moisture, pH, temperature and nitrification inhibitors of tea soils in relation to nitrification, ammonification and net mineralization of nitrogen (organic & inorganic sources). Influence of NK fertilizers on enzymes like nitrate reductase, protease and urease was studied which resulted in optimization of dosage, interval between two applications and efficiency of NK fertilizers. Vertical distribution of urease, protease, aryl sulfatase, acid and alkaline phosphatases in various agro climatic zones were documented. Toxic limits for Zn, Fe, Al and Mn were determined and the synergistic and antagonistic effects between the elements were documented. Experiments on impact of excess iron on foliage toxicity have also been documented. Soil application of various green manures like Crotalaria, Glyrecedia and Sesbania is being investigated to compare the efficacy of different green manures on productivity and quality of tea. The division currently focuses its attention on studying the influence of organic matter on productivity and measures to improve the soil health in tea gardens of south India. A survey was conducted in the Annamallais, the Nilgiris, Central Travancore, High Ranges, Wayanad, Nilgiri-Wayanad and Karnataka regions from which soil samples from various zones were collected and analysed for physico-chemical properties and enzyme activities. An attempt is being made to estimate humic acid and fulvic acid fractions in the soils of different regions and correlate the same with productivity. Field experiments have been laid out in different locations to study the impact of combination of synthetic fertilisers with organic manures and bio-fertilizers. Long term field experiments were carried out to optimize irrigation requirement of tea. The sprinkler irrigation at 6.25 cm/ha at 20 days interval was recommended for Wayanad region while drip irrigation at variable round depending on evapotranspiration along with NK by broadcast was found optimum. In Central Travancore, drip irrigation at 2 mm on alternate days with fertigation in 10 splits increased the yield significantly while sprinkler irrigation with variable round was optimum. In the Nilgiris, the yield increase was significant in fields under drip irrigation at 2 mm daily along with NK by broadcasting whereas sprinkler irrigation at variable round showed an increase in yield. In Karnataka, the sprinkler irrigation at 6.25 cm/ha at 20 days interval was recommended to get higher yield while drip irrigation at 2 mm daily with fertigation of N K2O 1:1 in 10 splits showed an enhancement in yield. The experiment on drip irrigation with fertigation is being continued at Karnataka to optimize the levels of nitrogen and potassium for fertilization. The present recommendation on liming is based on pH dependent acidity of tea soils. An attempt is being made to refine the methodology for working out lime requirement based on buffering capacity of soil. A multi locational trial is being conducted in different regions of south India to find out the suitable method for the calculation of buffering capacity of soil to arrive at site specific lime requirement. Biophos, an organically certified product was evaluated as a source of phosphorus as an alternative to foliar application of DAP. Experiment conducted at the Annamalais showed that Biophos at 250 ml in 250 litres of water could be used as an alternative to DAP. 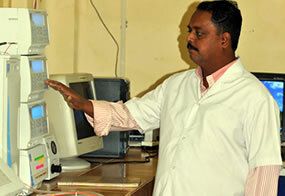 Multi locational trial is being conducted to prove the efficacy of biophos and its optimum dosage. A field experiment carried out on ammonium polyborate revealed that it could be used as an effective alternative to boric acid at 100 g per application in micronutrient spray. A multi locational field trial is being conducted to study the comparative efficacy of urea and neem coated urea in tea. A comparative study on phosphorus application is being conducted to investigate the impact of method of phosphorus application (broadcasting and placement) in relation to physical, chemical and biological characteristics of soil and made tea yield. 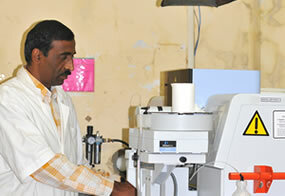 A research project funded by IFOAM under Common Fund for Commodities through Tea Board is under way at Chemistry Division to develop the technology, techniques and systems for organic tea production including the conversion of existing tea gardens into organic tea gardens. Based on the soil test crop response study, nitrogen use efficiency was experimentally determined at various locations and the average efficiency was found to be 60%. Based on this finding, the nitrogen requirement was worked out and recommended. A long term field study is being conducted to study the impact of nitrogen levels (as per soil test crop response study) in relation to yield. Chemistry Division is also carrying out field trial on foliar application of saturated solutions/suspensions of NPK with magnesium and micronutrients (Mangala Bio 20 and Mangala 3X) on yield and quality parameters of tea.